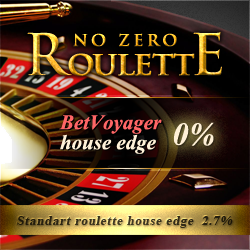 BetVoyager Casino is a unique online casino that uses several ground-breaking innovations in internet gambling to provide players with many novel playing opportunities, the chance to have flexible control over their gaming account, and the ability to independently verify the results of games. Casino takes all questions about fair play extremely seriously. In conjunction with random number generator, the casino uses unique Randomness Control technology based on the SHA-256 algorithm (the Secure Hash Algorithm family). This system gives players a 100% guarantee that the casino can’t affect the game process during play and lets players confirm the random nature of every game. To safeguard and secure your information, casino have put in place an internal control system to prevent any unauthorized access. This will ensure your information is secure. BetVoyager Casino is part of the BetCruise internet gambling portal, which is licensed by the government of the Netherland Antilles. The casino uses software developed by Gamesys N.V. in cooperation with an international assortment of companies. Gamesys N.V. has been active on the online gambling market since 2004. BetVoyager also has a wide variety of promotions such as; deposit and no deposit bonuses, Tournaments, Free Daily Lottery, Free spins, Free money, and other types of promotions. BetVoyager is always looking to improve. Whether it is creating real cash prize tournaments with real cash prize funds, or generous bonuses or free spins, BetVoyager is always looking to enhance a player’s gaming experience. All traditional slots have high fixed payout percentages. For the most part, they exceed 98%, meaning that the house edge is only 2%. Each slots game has two versions with different payout schemes, one of which offers a 100% return. One of the most popular slots is the 20-line 5-reel slots Casino, which offers a bonus game with up to 15 free spins. 3-reel Fortune Bell is designed using the Liberty Bell as its prototype. The Liberty Bell was the first slot machine to feature automatic cash payout when it was invented back in 1899 by Charles August Fey.